The following article was written by my grandson, Korey Wallace Huskonen, and entered in the Western Reserve Historical Society My Favorite Western Reserve Ancestor writing competition. He won $50 for first prize in the 18 and under category. Needless to say, I am quite proud of his article. As I was browsing through my grandparents’ vast collection of memorabilia recently, I noticed a peculiar-shaped piece of wood staring up at me. 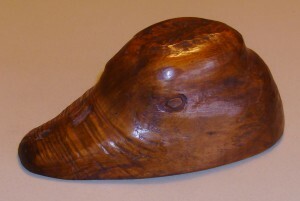 The wood had been carved to resemble a duck’s head, and appeared to be fairly old. But who carved it, and for what purpose? And why was it lying around my grandparents basement? Duck cup hand-carved by Walfrid Huskonen from a wood burl. As I was about to find out, that little piece of wood is much more than it seems. It wasn’t long before I learned that it had belonged to my great-grandfather, Walfrid Huskonen. He carved the wood himself, intending for it to be a drinking cup or bowl. A small hole was even included so a string could be threaded through, allowing the cup/bowl to be hung from a belt. At the time, I didn’t know much about my great-grandfather. He passed away well before my time, so I never had the chance to meet him. Being a curious-sort, I turned to my grandpa for help — thankfully, he’s a genealogist. He suggested doing some research, during which I discovered that Walfrid Herbert Huskonen was born in Ashtabula, Ohio, on August 11, 1911.1 He was born to Evert and Ida Huuskonen, who had both previously migrated to America from Finland. In fact, the trunk Ida brought with her to the U.S. is still in my grandparents’ house – I’ve walked by it enough times to know! Continuing on, Walfrid accomplished a great deal in a relatively small amount of time. He also has a lot in common with me. First, Walfrid was a member of the Andover (Ohio) High School Orchestra.4 He had played the trombone, and donned an interesting band uniform that consisted of maroon and gold capes and hats. I find this intriguing as Walfrid wasn’t actually a student at Andover. Instead, he attended Williamsfield High School, which was apparently too small to put out its own band/orchestra. 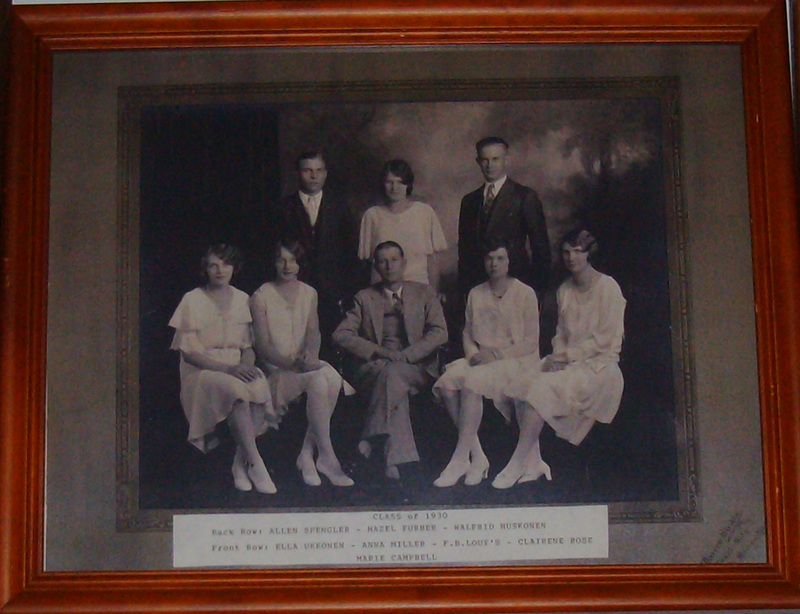 To put “small” into context, Walfrid’s 1930 graduating class was only made up of seven students.5 My school, Buckeye High School, is fairly small by today’s standards, yet its graduating classes are at least one-hundred students strong. Walfrid Huskonen, top right, in Williamsfield Senior Class of 1930. While I never played in an orchestra, I did partake in my Buckeye Elementary School’s band program. I played the trumpet, which is somewhat like the trombone and a member of the same family – brass. Unlike Walfrid, I only stayed with the band program for one year – it wasn’t really something I enjoyed. This may partly be attributed to the fact that band was one of the two B’s I have posted on a report card in the past five years. Outside of the band room, Walfrid was also a member of the Williamsfield High School basketball team in 1928.6 Basketball is another thing we share, as I currently play for Buckeye High School’s freshmen team. We also both have similar physical characteristics, such as height and a lengthy frame. These characteristics are quite useful when it comes to basketball. Moving forward in Walfrid’s life, he lived in Andover, Ohio, and worked at Glauber Brass in Kinsman, Ohio, in 1940.7 There he made foundry patterns used by the company to produce plumbing goods. However, it wasn’t long before my great-grandfather made the jump from employee to employer. In 1952, Walfrid and business-partner Roland Totten founded the Andover Pattern Company, which also was involved in the patternmaking business.8 Upon Walfrid’s death in 1965, the company was transferred entirely to Roland, and remained fully-operational. Eventually, it was passed down to Roland’s son, Tom. Overall, Andover Pattern was a very successful company. In 1992, the company celebrated its 40-year anniversary, and at that point was considered “a staple of the local economy.” Unfortunately, the company is no longer around today. Surprisingly, Walfrid accomplished such success without a secondary (college) education, as money had been tight at the time. Obviously, such a feat is quite inspiring, and I shall keep it in mind when pursuing my own career. I myself am very involved in business and economics. In particular, I frequently partake in the researching and trading of stocks (via simulators, of course). As far as his personal life went, Walfrid married Mary Jane Dingman. The couple had three children: Wallace, Viena, and Walfrid.9 I am quite familiar with one of his children (Wallace Huskonen), seeing as he is my grandpa! As mentioned before, Walfrid sadly passed away in 1965.10 He was 54 at the time, and had been suffering from rheumatoid arthritis, the painful inflammation of one’s joints. In my opinion, Walfrid lived a pretty inspiring, though fairly short, life. He enjoyed many of life’s joys – high school, owning a car, getting married, owning a business, and being a father. Thus, because of his success and character quality, Walfrid Huskonen is my favorite Western Reserve ancestor. I fully intend to carry on the Huskonen name with honor, pride, and integrity. Korey Wallace Huskonen won first prize in the 18-and- under category of the 2012 My Favorite Western Ancestor writing competition. For details on the 2013 competition, turn to page 22. 7. 1940 U.S. Federal Census, Ohio, Ashtabula County, Andover, Grace Tripp household. Walfrid was living with wife, Mary, and son Wallace in his mother-in-law’s home.